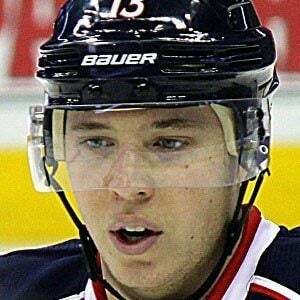 Hockey player who made his NHL debut as a member of the Columbus Blue Jackets in 2011. He previously won the NCAA National Championship with the Boston College Eagles in 2010. He was born in Greenwich and began playing at Boston College in 2008. He was named Most Valuable Player of the William Flynn Tournament while with the Springfield Falcons in the American Hockey League. He is the middle of five brothers. He was teammates with right winger Brian Gibbons on the Eagles team which won the 2009-10 NCAA Championship.